Number one rule in journalism: follow the money. When it comes to politics and who wants to buy your vote: follow the money. When I look to see what I could and should support, I like to look at the money. In Montgomery County it takes a lot of work to do it- mostly because the Board of Elections (or Board of [S]elections as I like to call them) has an incredibly bad, non-ADA (Americans with Disabilities Act) compliant website. 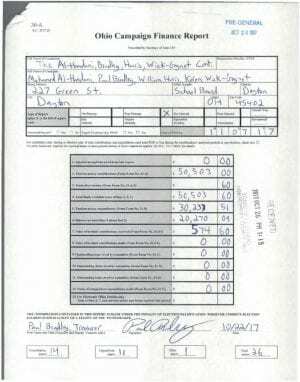 Everything about campaign finance reporting, accountability, and researchability is convoluted in Montgomery County. In Montgomery County, on Nov 7th, this Tuesday, we have three campaigns that share a common thread: Burges and Burges Strategists out of Cleveland. These are the people Nan likes, that Sinclair and the Human Services campaign likes, and who DPS used on their last levy- and who they then hired for “marketing consulting” as a payback. I’ve written about them considerably. Why do we hire consultants from out of town? This one makes sure to spread the money around locally to favored subcontractors. The main one being The Ohlmann Group, which also does work for Sinclair and Dayton Public Schools under a contract- even though DPS board members have publicly criticized the “work product” they’ve received. The funny thing is, I look down the list of donors, and, guess what I see? It’s pay to play. You have to donate to be a contractor. Like a kickback, only we don’t call it that. Let’s start with Issue 3, the Human Services levy. This is only half a levy, they come back around and do this all again in a few years for the other half the levy. Why is this? Well, it makes more money for companies like Ohlmann and Burges, and it means that if a levy does fail, it’s only half their money gone. That’s a lot of money. Where did it come from should be your next question. And, this is where is gets interesting- payroll deduction contributes a huge chunk. You work for any of the county agencies that benefit from this tax- you pay a vig out of your paycheck. There are literally 32 pages, 45 donations per page, of print outs of donations from employees of Job and Family Services, Stillwater, Information Tech Operations, Human Services Plan and Develop, Development Services Workforce, Juvenile Court, Mental Heath Board, Developmental Disabilities Services, Public Health, County Commission, Human Resources. Is this legal? Should it be? Well, this is how unions get so much power in politics. And, when you look at who backs these issues, unions are always all lined up behind them. The other donors? It’s only 7 pages, 8 donors per page. 56 donors, and of those, only 14 are small money (less than $500) donations. Most are deposits of the money from the employees, and then the 24 big boys and contractors. $257, 400. Note the big money from the hospital lobby? Guess what? None of them pay a property tax, but reap huge money back from this levy. And the Dayton Development Coalition and the Downtown Dayton Partnership- funded with some tax dollars. The Area Agency on Aging- is a primary beneficiary of these tax dollars- if not totally funded by them. Sounds fishy to you? And of course, there is Burges and Ohlman- throwing a kickback amount for the windfall that comes their way. Pay to Play all the way. Apparently, $5K buys a big ad contract in Montgomery County. And for the record, none of them are “union shops” and yet, all the promo materials they produce for the campaign- get Union bugs of some sort. The funny one is the signs- which have a “Graphics Art Guild” label- which isn’t a union, it’s a trade association. On to Issue 4, the Sinclair Levy. I run the opposition campaign, on the Keep Sinclair Fair website. We don’t get to charge a vig to Sinclair employees to fund our property tax levy (again, one of two levies- this is the big one, the other was added 2 years ago, is much smaller). Unlike most of the county workers who benefit from Issue 3 who get charged payroll deduction, Sinclair staff isn’t represented by a union. The saddest thing about looking at the payroll deduction is that President Stephen Johnson, who makes over $400K a year, only donates $100 a pay period, while one of his top lieutenants, Madeline Iseli, who makes about a third of his pay, donates $55. Here the donations get mixed in with all the payroll deduction amounts. And the numbers get even bigger. Hmmmm, one thing sticks out. 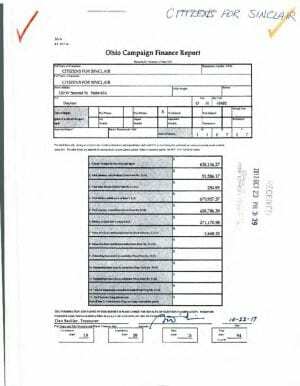 The amount spent on this levy- and the amount spent on Issue 3- $411,749.07. Almost the same. It’s as if these two campaigns are in cahoots. And why wouldn’t they be? Look who cashes in. If you compare the two campaigns- it’s as if central bookkeeping just sent duplicate invoices for the vendors. This isn’t the way things are normally done people. There is ZERO oversight of these vendors by the campaign committees- it’s as if the vendors just run the show. The last campaign is the School Board slate. Or the Al-Hamdani, Bradley, Harris, Wick-Gagnet Committee. This is more like an actual campaign. No payroll deductions, but not exactly a normal fund raising distribution. Almost all the donations are $100 or more. Many of the donors don’t live in the district- some don’t live in the state. Union money, PAC money. These donations look very different than those of other candidates for school board. Most were raised at two fundraisers, one at Corner Kitchen and another at Coco’s (full disclosure, I have done work for Karen Wick and Jim Gagnet of Coco’s for years). What is still missing is the money spent on media, and if that will be done by Ohlmann, or by Burges & Burges direct. 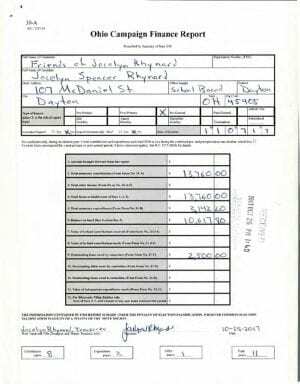 For comparison, you can look at the finance reports of school board candidate Joceyln Rhynard where there are much more random donation amounts, and none of the same vendors. Full disclosure, she bought her actual union made signs from my company. What is interesting is some of the same donors contributed to both campaigns- even though only four candidates can win. As a final note, here are some photos of the Burges purchased campaign signs with the fake union bug.